The M524 is a dual channel USB oscilloscope compatible with USB 2.0 and USB 1.1 interface. The ease of installation and connection to computer makes M522 extremely portable. The device is connected to computer using standard USB 2.0 cable and is powered directly from computer. The maximum power consumption of 2.25W makes this instrument highly usable with battery-powered notebooks. The software is the part of the M524 package. In order to keep the device functions up to date, there is a latest version of software available on our website free of charge. The software provides you with possibilty to fully operate the device. All standard features of modern DSOs (hold acquisition process, hold-off, zoom etc.) and many more (saving/loading the waveforms for future use, export to clipboard, printing the results together with scope settings) are available. 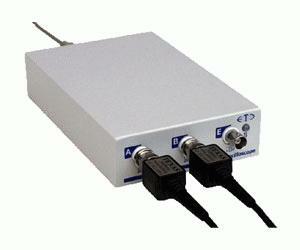 The fast data transfer offers extremely rapid display refresh (creating an impression of analog instrument).